Just a quick note to let everyone know that Tuesday (9/26) at 2pm EST I’ll be doing an AMA (“ask me anything”) on reddit. This will be a perfect opportunity to ask any questions you might have about the new War of Conquest (game mechanics, the Kickstarter, timeline, etc), the original version, other projects I’ve been involved in, or anything else. This is also a terrific opportunity to raise the visibility of War of Conquest, and to attract the interest of many more potential players (and even potential Kickstarter backers). Reddit’s IAmA group has millions of subscribers; if this catches the eye of just a small fraction of them, that’s a lot of potential new players! The AMA will show up as a post in reddit’s IAmA subreddit, here. The post should appear around 1:45 EST, so people can start writing up questions then, and I’ll start answering them at 2. I’ll be watching for new questions for at least a couple of hours, so stop by any time. For anyone not familiar with how reddit works, it’s similar to a bulletin board or forum, but instead of posts being listed in chronological order they are listed in order based on how many “upvotes” and “downvotes” they receive. Upvote a post to help raise it toward the top of the page where it will be seen by more people, or downvote it to bury it out of sight toward the bottom of the page. So one thing you can do if you visit the AMA Tuesday and find it worthwhile is upvote the AMA post itself to help more people see it, and another is to upvote any questions within it that you especially want to see answered! 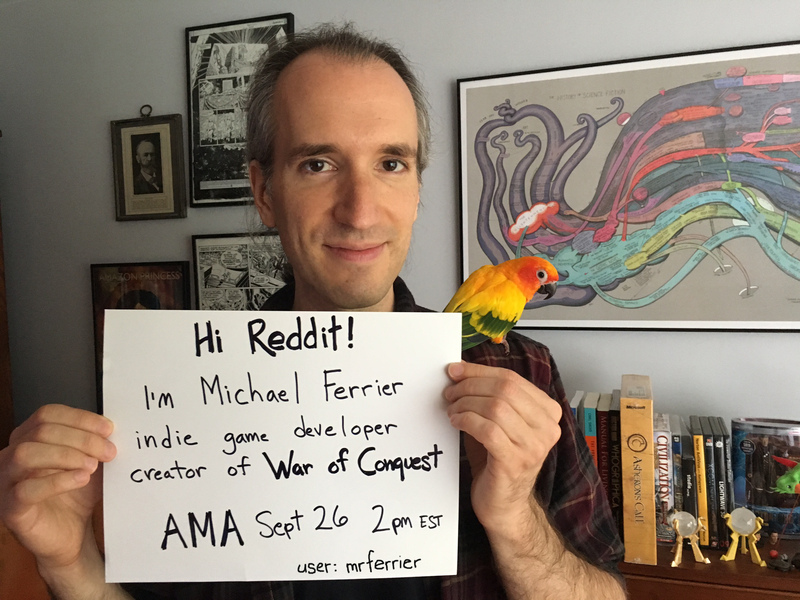 I hope to hear from a lot of you Tuesday afternoon… let’s bring War of Conquest to reddit!